Notice the control's date is from June but it was in the August security update. After installing the update, the Windows Common Control Library does not work. The issue seems to stem around a defective installation or registration of the OCX file. This update causes problems with existing Microsoft Access, VB6 and other applications using common controls such as the Treeview and Listbox controls. The symptoms are rather odd. It's not as if the control is completely missing or not registered. The control exists but does not behave correctly as events are not firing correctly. For instance, the Treeview control don't issue NodeClick events, so any code that expects the expansion of a node to display or load more data fails. It took us a while to discover that a change in this control caused this problem. In other cases, users are reporting that Microsoft Access locks up and crashes. People are also reporting problems with this in Visual Basic 6 (VB6) applications. Here are additional reports of issues associated with this patch. If your PC received the security update and you're using the Microsoft Access 2010, 2007, 2003, 2002, or 2000 version of Total Access Analyzer, the Treeview control in our Database Explorer view no longer functions properly. Microsoft has acknowledged problems with their security update that is causing these problems. The issue is caused by a registration of the updated MSCOMCTL.OCX file. Microsoft has released a Knowledgebase article 2687441 addressing this problem entitled: MS12-060: Description of the security update for 2007 Office system: August 14, 2012. The article goes into details about unregistering the control and re-registering it using a batch file calling REGEDIT.EXE. In our internal testing, we've discovered that the recommended steps don't work in most cases. Just unregistering and re-registering the control doesn't solve the problem. We tried adding a reboot between steps, but that didn't help either. The steps below work consistently. An technical explanation why is given at the end. You need Administrator rights to make registry changes. Depending on your operating system and Windows login rights, you may not be allowed to do this. 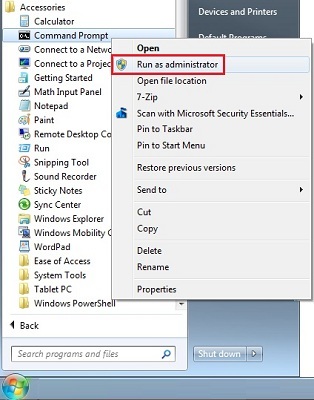 From your Windows Start button under, All Programs, Accessories, launch the Command Prompt by right clicking on it and choosing "Run as administrator". You can then copy the Regsvr32.exe command lines described below into the dialog. Copy a legacy version of the MSCOMCTL.OCX file to your C:\Windows\System32 folder. For your convenience, a zipped copy from 2011 is here. Open Microsoft Access and then retest the control. It should be working at this point. Copy a legacy version of the MSCOMCTL.OCX file to your C:\Windows\SYSWOW64 folder. For your convenience, a zipped copy from 2011 is here. The problem is that the update leaves some old 2.0 Version entries in the Registry. The previous MSCOMCTL.OCX carried the version number 2.0 (the *File* Version is 6.something but in the registry it's known as Version 2.0). The patch installs the new version but leaves a part of the old registry settings. Thank you Andrew for sharing your insight! Microsoft has since provided an update to their page. Microsoft Access 2000-2016 Version is shipping! Supports 32 and 64-bit versions of Microsoft Access 2016, 2013, 2010, 2007, 2003, 2002, and 2000! "Add some zing to your apps!"